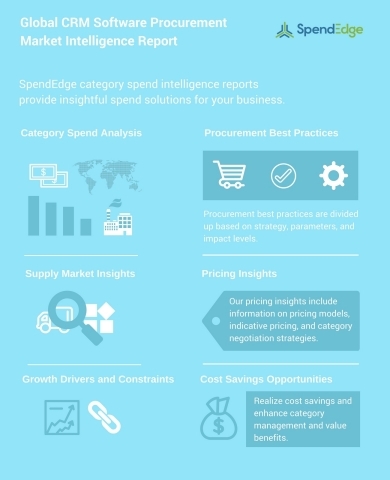 LONDON--(BUSINESS WIRE)--Global procurement intelligence advisory firm, SpendEdge, has announced the release of their ‘CRM Software Procurement Research Report.' The insights and data in this report provide a strategic analysis of the supply markets, factors influencing purchasing decisions, procurement best practices, pricing models, supplier landscape, and an analysis of the supplier capability matrix for the IT industry. This report breaks down the data and analysis behind the procurement of CRM software and acts as an all-inclusive guide for making smart purchasing decisions. “The growth of the global CRM software market can be attributed to the increased adoption of cloud-based CRM software solutions due to their low costs and easy maintenance capabilities,” says SpendEdge procurement research analyst Bhuvaneshwari Udayakumar. “Also, the growing need to enhance customer retention rate is driving the demand for CRM software applications across geographies,” added Bhuvaneshwari. SpendEdge sample reports are free of charge and provide insights that focus on cost-saving aspects of procurement and optimization of category spend. The increase in usage of cloud-based CRM applications is mainly due to its cost-effective solutions with easy deployment and maintenance capabilities. The CRM market is further expected to grow in the coming years owing to the increased adoption of social CRM to focus on resolving customer queries via social platforms. Procurement managers should adopt systematic procurement practices that allow them to exert better control over service providers, irrespective of prevailing market conditions. Furthermore, this will help them manage expenses and service quality better. One of the major challenges faced by the buyers is the difficulty in migrating data from existing CRM solutions to cloud-based CRM solutions due to the complexities associated with such data transfers. To overcome this, the procurement professionals should perform periodic vulnerability assessments. The per-user licensing model is the most widely-adopted pricing model in the global CRM software market as buyers need to pay only as per usage resulting in higher ROI. The subscription-based and modular pricing model also find comparable adoption. In the modular pricing model, buyers pay only for the required functionalities whereas in the subscription-based pricing model the subscription costs are relatively high and enable buyers to obtain better and faster ROI since the prices are fixed. We also customize reports to meet clients’ requirements. SpendEdge shares your passion for driving sourcing and procurement excellence. We are a preferred procurement intelligence partner for Fortune 500 firms and other leading companies across numerous industries. Our strength lies in delivering robust, real-time procurement market intelligence that helps sourcing and procurement professionals make informed decisions. These innovative procurement solutions help enterprises transform structural capabilities, improve execution efficiency, and fast-track time to savings. SpendEdge has announced the release of their Global CRM Software Procurement Market Intelligence Report.